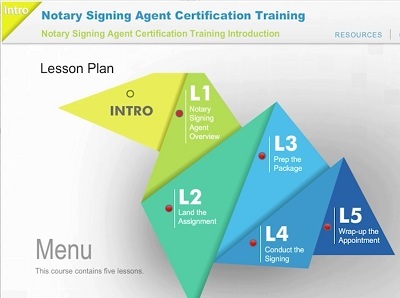 After more than a year of research and development, the NNA is proud to launch the most comprehensive Notary Signing Agent Certification eLearning course available in the U.S. The NNA’s flagship Notary Signing Agent training product has a whole new look and feel, but more importantly, its interactive content is more engaging, making it easier, and more fun, to learn. The upgraded program introduces Notaries to the opportunities associated with becoming a signing agent and helps them understand the role signing agents play within the real estate finance industry. Steven Bastian, the NNA’s Director of Product Management, emphasized that understanding the entire mortgage ecosystem from the contracting company’s point of view provides context and will help signing agents identify who their customers really are and why good customer service is vital. Keeping the focus on customer service, the eLearning course equips Notaries who wish to become signing agents with the skills and knowledge to confidently perform loan signing assignments. How to handle the paperwork step-by-step using an annotated loan package. The course menu is completely open so seasoned signing agents can directly navigate to and explore specific subjects they’re interested in. Knowing how to do a signing agent’s work is only part of the equation though. The Notary Signing Agent Certification eLearning Course covers what contracting companies look for in signing agents, how to become a preferred resource, and it follows the Code of Conduct published by the Signing Professionals Workgroup. Many signing agents get their assignments from title companies and signing services, so it’s important to understand the challenges contracting companies face when they answer to their clients: the lenders. The Notary Signing Agent Certification eLearning Course includes an NSA Training Course companion study guide, which covers additional information on the NSA exam. The entire course takes an average of less than five hours to complete and can be taken with, or without, the NSA exam. Additionally, the eLearning course includes general business tips such as what features to look for when purchasing a printer, appropriate attire for loan-signing appointments, and how to start getting work as a signing agent. Completing the eLearning course will help signing agents exceed the expectations of the companies that hire them. How much does it cost to do the eLearning course as a signing agent and how much will it cost to take the exam? Is the exam taken online as well? Hello Jide, The eLearning course along with the exam is available for $179 and includes the companion study guide book as well as a background screening. Yes, the exam is done online. More details about the course can be found by clicking "Signing Agent" at the top of this page. Does the NNA course affects Maryland. Hello Charles, The signing agent course is available in every state, including Maryland. I purchased the Companion Guide two years ago. Will I have to purchse a new guide next year when I have to renew my certification? Hi Joan, the quick answer is no. 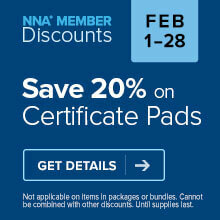 We're offering the NSA certification exam separately from the training course. When you renew next year, you can opt for the package without training. While training is not required, we do recommend it. Can a notary notarize witness to a will if they are to benefit from the will? They also can't notarize themselves as witness, correct?? Thanks for your questions, Sylvia. No, a Notary may not notarize a document that they would benefit from. And no, a Notary may not notarize their own signature. I have not become a state notary yet but will apply next week. I would like to know if the eLearning course is available during my initial request to become a notary? Hello Lynette, You must be a commissioned Notary before starting the certification process. Please see here for more information: http://www.nationalnotary.org/signing-agent/nsa. My commission and recertification was renew a few months ago may I think I completed the e-Learning course and the examination as well in order to get my renewal. Please respond to my request Thank you. Hi Nora, You can email our Customer Care team for assistance at Service@NationalNotary.org. Thanks and have a good day. I'm already a certified notary signing agent, but I need a refresher course in both notary and loan signing is it still the same price. I don't need an exam I don't think because I have 21/2 more years on my commission. But I'm not active. Hi - i am a notary and have ample experience in the mortgage industry. Should i take the course or should i just take the exam to become a signing agent? Hello. New federal rules are making major changes to the loan document signing process. For more information, please see here:http://www.nationalnotary.org/notary-bulletin/blog/2015/08/changes-closing-disclosure-mortgage-industry. Because of these changes, many companies that work with signing agents are expecting them to show proof that they are trained and familiar with these changes in order to receive assignments. We encourage you to research different training and education options and choose the program you feel is best for you. If you have other questions about NNA signing agent training, please feel free to email us at social@nationalnotary.org and we'll be happy to help you further. I would like to take the online training course for the NSA exam (which I took once and did not pass) so I can study before I retake...how can I sign up for the training course now that I have already bought the lower-priced package? Hi Diane. If you contact our Customer Care team at Services@NationalNotary.org or 1-800-876-6827, they should be able to help you sign up for the training course. I am already a notary and would like to become a signing agent. How much is just the training course? How much can I expect to earn as a signing agent in NW Florida? And since I am newly commissioned, can I take this course? Hello. If you have received your Notary commission, you should be able to take the course. For more information, you can visit www.nationalnotary.org/signing-agent. While fees for notarial acts are set by state law, Signing Agent fees for the additional services you provide for loan document packages are negotiated on a case by case basis between you and the companies you work with. You will need to determine what a reasonable fee is for your services and negotiate that fee with companies offering you assignments. How long is the course? How many hours? Hello. As mentioned in the article, the entire course takes an average of less than five hours to complete and can be taken with, or without, the NSA exam.